NEW WOOD FLOOR IN LIVING AREA AND BEDROOMS! EXTERIOR AND DECKING LIKE NEW! FREE NEWLY RENOVATED GOLF CART! WE NOW HAVE AMAZON FIRE STICKS , FLAT SCREEN TVS AND WI-FI IN ALL BEDROOMS AND LIVING AREAS, AND BLU-RAY DVD WITH WI-FI ACCESS TO ALL YOUR ONLINE ENTERTAINMENT SITES. NEW WOOD FLOORS IN ENTIRE HOUSE. ALL NEW TOWELS AND LINENS. 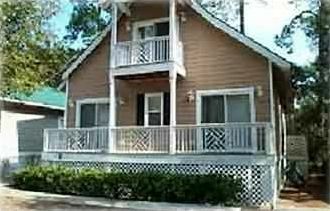 ONE OF THE BEST PRICED HOMES ON FRIPP ISLAND WITH GREAT RATES FOR ALL SEASONS !! IF YOU STAY ANYWHERE ELSE AND DON'T ASK US FIRST, YOU MAY BE PAYING TOO MUCH!!! ALL SEASON AVAILABILITY. ASK ABOUT OUR SPECIAL FALL AND WINTER PLANS. IF YOU ARE LOOKING FOR A LONG-TERM RENTAL, ASK US. 3BR/3BA home on a lagoon and the 17th fairway of the award-winning Ocean Creek Golf Course. You can watch the Ospreys gather in the trees on the lagoon across from your porch. Only a 5 minute walk or 2 minute ride in your free golf cart to access point to one of the best beaches in the United States. 2 BR downstairs with 2 queen beds in each BR. Master upstairs with king bed. All bedrooms have separate bath with shower. Take advantage of the year-round wonderful weather to treat yourself to a fabulous island getaway. Pleasant ocean breezes in the summer and mild winters insure your vacation will be most enjoyable. Located on the shores of the Atlantic Ocean in the beautiful South Carolina lowcountry, Fripp Island is only 16 miles from beautiful, historic Beaufort, location of most Pat Conroy novels; filming location for The Big Chill, Prince of Tides, Glory and other films. Home to over 100 antebellum homes; 45 miles from Savannah, GA and 75 miles from Charleston, SC, tow roof the most visited cities in the US.. Enjoy luxurious accommodations. Plan your meals in the full kitchen or enjoy the many unique and excellent restaurants in the area and in nearby Beaufort. You can play golf on any of several great courses located nearby; play tennis on nearby courts; or enjoy an invigorating walk on the white sandy beach. All are a short walk or drive from your home. Many of the activities available on or close to Fripp Island are described in this listing. Keywords: 3BR /3BA Fripp Ocean Creek Cottage with screened porch overlooking a Lagoon and the 17th fairway of the Ocean Creek Golf Course. WE DO NOT PROVIDE AMENITY CARDS FOR ANY RENTALS. WE DO PROVIDE A FREE GOLF CART. We are Linda and Ken. We moved back to Beaufort in the mid 90s. Linda grew up in Beaufort and has always called it home, even when we were not living here. Our family loves the area and our grandchildren think this is their home, although they and their parents live elsewhere. We like the lowcountry atmosphere, the beauty of Beaufort and the family-friendly atmosphere at Fripp. We also love the best beach on the East coast. We are only 16 miles from Fripp Island. We wanted a rental property a short distance from us in a family-friendly area. We did not want Hilton Head as it has grown too big and too crowded. On Fripp, you can can walk on the beach and feel like you are on a secluded island in the Caribbean, and yet be only an hour and a half from Savannah or Charleston. The golf courses in the area are superb and the dining choices in and around Beaufort are varied and excellent. Charleston and Savannah are ranked in the top 10 friendliest cities in the world/ Beaufort's Historical District is one of the top 10 in the US. Deer abound through out the island. Fripp is a kid's paradise. The island is secure and your children can have a lot more freedom than in a more crowded vacation location. If you like shopping, dining, exploring antebellum homes or just relaxing, Fripp is in the middle of all this. And it is much more reasonable than similar island vacation resorts. We chose this home because of the location and the three bedrooms each with its own bath. The back porch is on a lagoon and the 17th fairway of the Ocean Creek course. You can sit in one of the four rockers and read or just relax in a very peaceful surrounding. In the afternoon deer will wander onto the property and graze. Occasionally you might see an alligator in the lagoon. Cottage is on 17th fairway of the award-winning Ocean Creek golf course and on a lagoon. Property is on a lagoon and the 17th fairway of the Ocean Creek Golf Course. Property is a 5 minute walk to the Beach. Separate zone downstairs and in master bedroom upstairs. There is space for 2 vehicles at the house. Additional vehicles must park at the entrance to the Island. Wireless router in the home. 32 inch smart TV flat screen in living area and 24 inch flat screen in each bedroom. Amazon Fire Sticks in living area and all bedrooms. Lots of books and games for your enjoyment. 4 rocking chairs on porch. 2 championship rated golf courses on Island, Golf Cart or Moped Rental, Close to Historic Beaufort with over 100 ante-bellum homes.